For a madcap family movie, The Secret Life of Pets raises some deeply disturbing questions. How much libido could fuel a romantic subplot when the lovers have been neutered? Why does “No Sleep Till Brooklyn” cue up during a drive into Manhattan? And exactly where is the autonomic system located on a sausage? Alas, The Secret Life of Pets, directed by Chris Renaud and Yarrow Cheney (Despicable Me franchise veterans), answers none of these questions. Instead, the movie offers up a diverting animated comedy with plenty of action but little cohesion or earned emotion to back it up. The plot, as much as it exists other than to fling a Bronx Zoo’s worth of animals across New York City set pieces, hints at a Toy Story-light conflict between earnest terrier Max (Louis C.K.) and the newly adopted Duke (Eric Stonestreet), a gruff Newfoundland with a sad past. It’s fitting that Duke, a shaggy dog, gets the action going. Once he and Max find themselves captured by the only two animal control officers in a city of 8 million, the sole remaining tension is whether Max and Duke will learn to get along before or after a successful rescue effort, as led by Gidget the tougher-than-she-looks Pomeranian (Jenny Slate) and Chloe, a scene-stealing cat (Lake Bell). 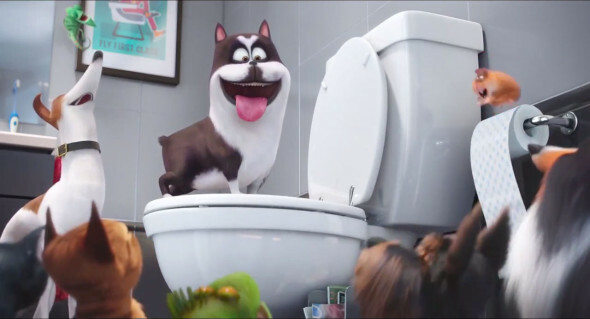 The Secret Life of Pets features inspired physical comedy, in a Buster-Keaton-meets-future-theme-park-ride kind of way that turned the Minions into cash cows. But it’s Pixar without the pathos: the movie never misses a chance to ignore any avenue for genuine emotion, whether it’s Duke learning what happened to his former owner or the streetwise villain Snowball (Kevin Hart, playing to the back row) hinting at the dark desires that animals really harbor toward their fickle owners. It’s the single-note drone of the movie’s action that makes the glimpses of what might have been all the more remarkable. An extended fantasy sequence in a Brooklyn sausage factory takes place for no reason other than setting up a song-and-dance number that’s a drugged-out tribute to edible body horror, complete with dancing hot dogs made rapturous by their imminent consumption. None of this advances the plot in any way, but it’s a rare delight in a movie mostly content to coast. In the end, predators and prey make amends, Max and Duke are ready for a sequel and a reliable supporting cast have made their case for a spinoff. Not bad for a day’s work in New York. But the real secret is that our pets are very much like their human counterparts: they share our likes and dislikes, our strengths and our flaws, and — most of all — our willingness to settle for just good enough.